A 2017 addition to The Snowy Series! 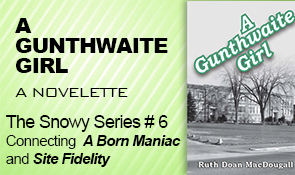 If you have not read the earlier titles in The Snowy Series (#1 - #5), A GUNTHWAITE GIRL will serve as an introduction to the main characters so that you can more fully enjoy the sixth title, Site Fidelity. Henrietta Snow, known as Snowy, sat beside Tom Forbes on the log and looked at the mountain pond, listening to him talk about grease pits. It was June now, sunny and hot and breezy, and she was seeing double, the exuberantly green trees and the trees’ rippling reflection in the blue water that matched the sky. Tom smelled of fly dope. So did she. Blackfly season theoretically lasted from Mother’s Day to Father’s Day, and yesterday had been Father’s Day, but the blackflies had disregarded the cutoff date. Varney’s, she thought. Stanley Varney had owned the gas station near the high school in Gunthwaite, New Hampshire, her hometown and Tom’s. High-school guys had worked on their own cars there as well as on customers’; you’d glimpse a jalopy’s hood up and a guy headfirst into its guts or a jalopy with a guy’s feet sticking out from beneath. Mostly, however, they seemed to spend their time whistling at girls (well, Tom had been too cool to be a whistler), and when she had walked past she’d pretended to ignore them while all her antennae radiated, seeking Tom. As they smiled ruefully at each other, Snowy realized that their expressions matched, like the pond and the sky. Oh horrors, were she and Tom really growing to look alike, as married couples were said to? They weren’t married—indeed, they each had been married in the past to somebody else—but they had met in 1954, the spring of her freshman year, and started dating the next year, so now in 2005 they had known each other for how long? Fifty-one years! And they had been living together for nine years. But no, they did not look alike, Tom at sixty-seven with his handsome square face, his once-curly white hair getting straighter and thinner, his trimmed white beard, his rimless trifocals, she at sixty-six still sort of cute and still sort of blonde (thanks to her hairdresser’s highlights). Yet she knew that they did share some facial expressions, and their minds sure were apt to travel the same paths. Their L.L.Bean hiking boots this Monday had traveled three miles up the Swiftwater Mountain Trail to the pond for a picnic lunch. From L.L.Bean had also come their tropic-weight long-sleeved shirts and long pants; during blackfly season, if you were wise you didn’t hike in a T-shirt and shorts. A half hour ago they had finished their sandwiches and cookies, the Saran Wrap now stuffed in the lunch bag in Tom’s pack, which was waiting on the ground beside hers for the hike back down. Yet they were lingering, to Snowy’s relief. She felt exhausted, even though on her birthday in March her daughter, Ruhamah, had announced that it was time for Snowy to take Mondays off from work at her Woodcombe General Store, instead of just Sunday afternoons. Implied: Snowy was getting old. Ruhamah, named after a New Hampshire poet whose name was pronounced Ru-hay-mah, was now thirty-four. Thus Snowy had all of today off as well as yesterday afternoon, but nonetheless she felt worn out. And despite ibuprofen, her back was killing her. She leaned against Tom, who, because of Ruhamah’s edict, was now taking Mondays off from his coffin factory when he wasn’t working at his other job, fire warden up in Mount Pascataquac’s fire tower. Although he never mentioned his bad knee, which had been banged up in high-school football, probably it was bothering him as much as her back was. Ah, the golden years. He put his arm around her. The security of his arm, the beauty of the scene. She should be feeling just happily tired from the hike up the mountain, content, at peace. Suddenly Tom whispered, “Look.” He moved his free hand slightly toward the pond’s outlet, where Swiftwater Brook meandered into the woods before it lived up to its name and began its plunging descent. On the opposite bank, twin black bear cubs came scampering out of the woods and romped along the edge of the pond. She and Tom had seen several bears over the years, but bears still scared her, especially the brazen ones who made forays into backyards to grab bird feeders and couldn’t be frightened off. However, these cubs were adorable, small and self-absorbed. And then, following them, out of the woods plodded Mom. Mama Bear. Her fur shone glossy in the sun, and her vast bulk was just plain terrifying. Snowy tensed. She felt Tom tense. The rule: never get between a mother bear and her cubs. Shouldn’t she and Tom make a racket, to warn the bears they were here? Mom stopped in her tracks, sank down heavily on the bank, and went to sleep. “She’s tuckered out,” Snowy whispered, remembering the cares of motherhood. The cubs paid no attention to Mom’s nap and continued frolicking along the pond. Very quietly, she and Tom got up, slid into their packs, collected their four trekking poles, and stepped into the woods. The weight of her pack eased the back pain by pulling her spine straight. Away from the pond and the bears, they rejoined the trail alongside the brook. After they scrambled over some boulders, the brook picked up speed in a rush and they dropped fast down the trail, which crossed the brook on rocks seven times during the descent, crossings that had presented Snowy with an anxious balancing challenge the first time Tom had brought her here, for an overnight backpack on his fiftieth birthday. She still had to concentrate; strolling across brooks wasn’t second nature, the way it was to Tom. The brook crashed into a meadow that had once been a beaver pond and was now being invaded by saplings, the trail skirting it briefly through more woods. Then they came out on the logging road. The vehicle that awaited them here continued to startle her, even though five whole years had passed since Tom had finally recognized that his ancient green Jeep could no longer be patched up enough to pass inspection and had given it to Ruhamah and D. J., her husband, to use on their farm but not on roads. He’d bought a secondhand black Ford Ranger pickup that, to put it mildly and sadly, did not have the Jeep’s character or history. Snowy knew she ought to love it, something different in their lives, but perversely she missed the Jeep. She shrugged out of her pack. Along dirt roads they drove up to High Knoll Road, where he braked for the view of one of the mountain ranges that loomed over Woodcombe. “Remember the lovely fog in Scotland?” The mountains were beautiful, and she was still feeling perverse. She and Tom had made a trip to the Hebrides five years ago; they knew fog. But now she was remembering that these past two years New Hampshire had been named “The Most Livable State” by State Rankings, an annual reference book. On they went, past white Capes and red or gray or white barns sitting amid fields of buttercups, daisies, and Indian paintbrush, down into Woodcombe village. When the summer people were here in full force, she would make herself see it through their eyes, a village hailed as one of the prettiest in New Hampshire, a village she’d overheard some tourists call “Brigadoon.” But now it was too damn familiar, after the long winter’s imprisonment. Woodcombe was a prison—and an anchor. The place dragged at her like a fathoms-deep anchor, its white houses under tall maples with roses blooming in front yards, its town hall and library and high-steepled church and the quaint general store that she and her husband, Alan Sutherland, had bought in 1985. There the store stood, the heart of the village, a white clapboard building with a long screened front porch where on the deacon’s bench some folks were schmoozing. After Alan committed suicide in 1987 when the store was on the verge of bankruptcy, she had sold their home, Hurricane Farm, and she and Ruhamah had moved into an apartment over the store and kept it going all these years. But the income still remained precarious through the winter months. And this winter her daughter had convinced her to proceed with a project that Ruhamah had long had in mind, buying another general store, in the nearby village of Thetford. The very idea had always made Snowy panic, but Ruhamah was the one with the MBA so Snowy had acquiesced. Why oh why couldn’t the worry about money at least provide the thrill of risk-taking? But no, it was a weight, an anchor. The cabin fever of winter had become spring fever. David’s big pickup, the so-called company truck, was parked to the right of the open double doors. Tom parked on the left. Carrying their packs and poles, she and Tom went into the barn, an expanse full of things she’d learned the names of to make them less terrifying—radial-arm saw, thickness planer, a joiner, a lathe, a drill press, and such. The barn’s old stalls held stacks of lumber. David was working on one of North Country’s specialties, a pine coffin that Tom had designed to serve as a coffee table until needed. You could also order coffins for use as a bookcase or an entertainment center, a bed or blanket chest or whatever your heart desired. Nonetheless, North Country’s best sellers were plain pine coffins. “Oh.” The Association of New Hampshire Writers. Probably it was Andy—Andrea Edgecomb, who’d become the new executive director a couple of years ago. Probably Andy was cooking up a poetry workshop. While Tom stayed downstairs to confer with David, Snowy climbed the staircase to the apartment, where she dumped her pack on the kitchen floor, leaned her poles against a cupboard, sat down at the trestle table that Tom had built, and took off her hiking boots and socks. Barefoot, she walked over to the counter and hit the answering machine’s button. Andy said, “Snowy, could you give me a call as soon as possible? I have exciting news!” An extremely efficient young woman set on a career in nonprofits, Andy was always enthusiastic, but she sounded really excited, more than she’d be about delivering another invitation to do another workshop. Continue reading! Paperback, iBook, and Kindle versions available.